Story: On any Sunday you can smell it in the air, taste it in the atmosphere and see it in the clear. The Skitch is not a beer goggle, but the next best thing to one. We've got the facts to prove it. 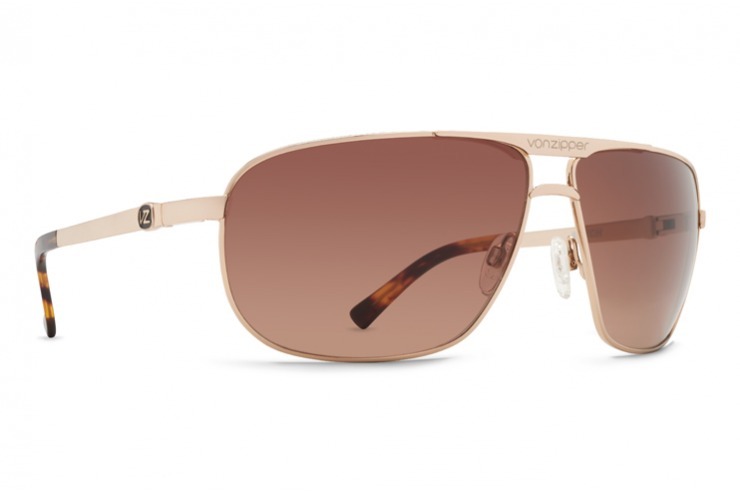 Specs: VonZipper Skitch aviator sunglasses are made from optical quality alloy and held together with stainless steel optical hinges. The base 8 spherical impact resistant polycarbonate lenses will protect your eyes with 100% UV protection. Silicone nose pads will keep these shades sitting on your face. As soon as I picked these up I could tell that they were not cheap sunglasses. They are hefty but not bulky. The gold chrome finish makes them standout. Posh. The lenses have a slight curve inward that keeps the sunlight out of your peripheral vision. Keeps the sun out without being too dark. Absolutely gorgeous glasses. Only complaint I have is the bulky case. It's to big to fit inside your coat pocket or your cars console. But I did not buy for them the case. I bought them for the quality.